Okay, maybe you don’t need to have them, once you know what they are, but at least let me try to convince you. If you have read my food blogs these past 6 months, you probably know that I don’t cook bland food. Intense flavors with strong ethnic roots dominate my cooking. I imagine they also have homes with lots of the color Beige. But I know that is unfair because I know some serious eaters whose environments are primarily neutral and earth tones. So I’ll admit that my living room has been referred to as the ‘Fruit Salad Room.’ That would be due to the three mango- colored walls, with the fourth one raspberry and a blueberry- colored fireplace in the center of it. Not for the timid in terms of décor. The colors are warm in the winter and cool in the summer and I love them. And they are not for everybody. Pomegranate Molasses – I started using this long before pomegranates achieved their present Foodie status. It is the perfect sweet/sour addition to a dish. This ingredient is central in Fesenjoon, one of the signature dishes in Persian cuisine. It is has ground walnuts and Pomegranate Molasses. There are lots of recipes on the web for it. Talk about addictive! 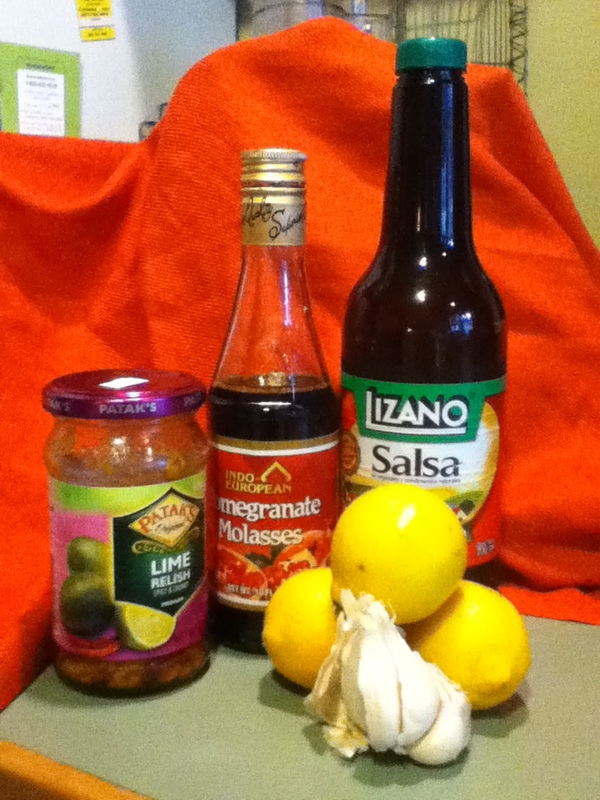 See the recipes below for my favorite salad dressing. Indian Lime Relish or Pickle – I admit this qualifies as an acquired taste. (But, hey, so does coffee…) Don’t start eating this straight, unless you are entranced by the strong smell. But you can put a few teaspoons of it into things like tuna fish salad, egg salad, and black bean or other bean puree and it gives an undertone of depth and tartness that nobody can identify. Check out the two recipes below for ideas. Lizano Salsa – I visited the farm of a friend who trains horses to help her teach Leadership to executives and others who want to tap into their own inner authority. 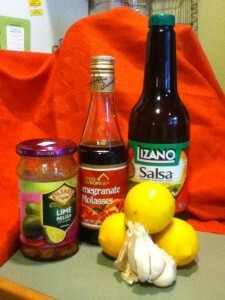 I whipped up a great frittata for breakfast and she broke out the Lizano Salsa, a staple on Costa Ricans tables. It is spectacular with eggs, in marinades and soups. Think Mexico meets the Caribbean. I found it online and it was worth the search. And here are some of the staples I try to have in my pantry: fresh garlic, canned anchovies and anchovy paste, several kinds of hot sauces- Frank’s Original is my favorite- pitted kalamata olives, capers, sun dried tomatoes (Trader Joe’s has freeze dried ones that are flavorful and fat free), marinated artichokes, mustards that include Dijon, grainy, hot and sweet, Feta cheese, good Parmesan or Romano, several kinds of vinegars: balsamic, rice wine, sherry wine, cider; a good array of olive oils and other oils, a selection of salts and a few different kinds of peppers, candied ginger and of course plenty of lemons. Mix together. Enough for 2 large salads. Store in refrigerator. Mix or pulse all ingredients except tuna in processor. Add tuna and mix or pulse to the consistency you like. Stuff a baked potato with tiny green peas, a tablespoon of lime pickle and then melt grated cheese on top. You can use a mixture of feta and cheddar or any kind of cheese you like melting. I mix it all together and it makes me very happy! Marinate chicken pieces for a few hours or overnight. Bake or grill, basting with the sauce. I’m always interested in hearing what other people can’t imagine cooking without. Share your favorites and we can swap more recipes!